5.48 seconds. That’s the amount of time it takes the worlds’ fastest climber to ascend 15 meters (just shy of 50 feet). That’s nearly nine vertical feet every second and it happens on a wall with five degrees overhang and a route, while not officially graded, generally accepted to be in the low 5.10’s. It’s a route that never changes. Different from disciplines where climbers must solve routes and problems as they ascend, the speed climbers’ sole ambition is to refine movement and calibrate technique to propel them upwards where a fraction of a second separates the winner from the loser. This all plays out in an epic head-to-head battle of raw athleticism and pinpoint accuracy. An explosion of disciplined energy where athletes sprint towards a skyward finish line all to be crowned the fastest in the world. The current world record is fresh. Just ﬁve weeks ago in Nanjing, China, Reza Alipourshenazandifar of Iran stopped the clock at 5.48 seconds. At the same event, Iuliia Kaplina of Russia bested her previous World Record and set a new women’s bar of 7.38 seconds. Despite these amazing achievements, speed climbing has its detractors and remains as the least recognized discipline in a rapidly evolving sport. Anyone who has ever challenged another person to a foot race can understand speed climbing. Two competitors moving across a ﬁxed course with the fastest across the line taking the title. 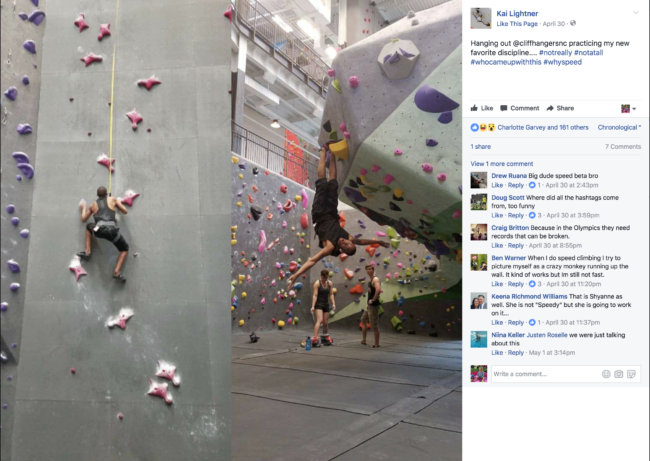 Detractors say that speed climbing is an artiﬁcial sport contrived and without any purpose or connection to the broader practice of climbing. However, speed climbing, like all other disciplines of modern rock climbing, has emerged from the core disciplines of alpinism brought into the modern climbing conscience by climbers like Dan Osmond, Hans Florine, and Ueli Steck. More than anything, speed climbing is the new kid on the block trying to break into a neighborhood crew that have spent years together. The fact is that many people credit speed climbing as a key variable in the decision to include climbing in the Olympics. Like it or not, speed climbing may be one of the best ambassadors to introduce competition climbing to the masses. 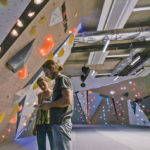 While many see this as a a great advancement for the sport of climbing, some take issue with the Olympic Combined Format. In fact, many climbers expressed concerned over the scoring format when the announcement about the Olympics was made last year. Most of today’s top competitive climbers focus on one or two disciplines and very few athletes excel in all three categories. 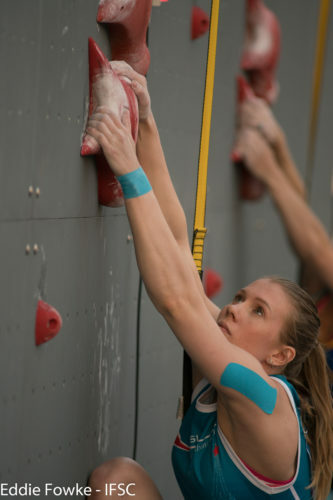 The combined format scores the world’s top 20 male and 20 female climbers based on their overall performance in bouldering, lead, and speed. 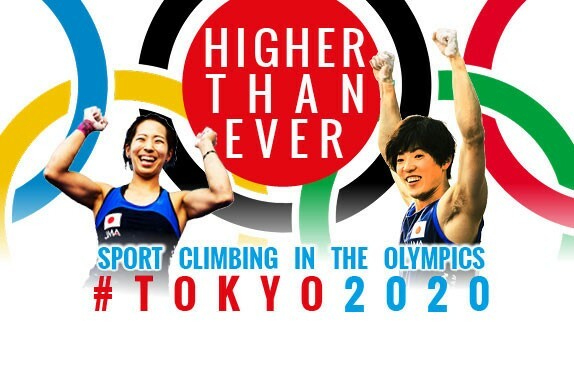 This decision will likely reshape the current ﬁeld of competitors and how they rank among medal-winning Olympic climbers. 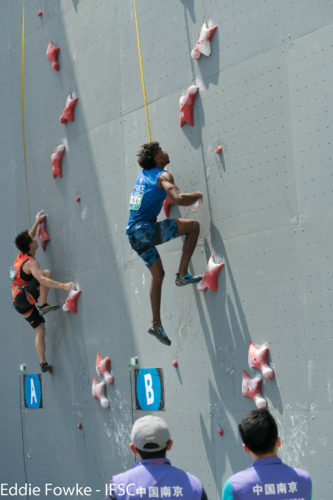 In many ways overshadowed by the IOC’s announcement last summer, the IFSC announced another major shift that will effect competition speed climbing moving forward. 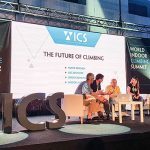 On July 1st, 2016, the IFSC notiﬁed climbing federations and teams that auto belays would be required for use in all world record speed events and that C-3 Manufacturing, maker of Perfect Descent Climbing Systems, had been awarded the exclusive supplier license through the 2020 Olympic Games. 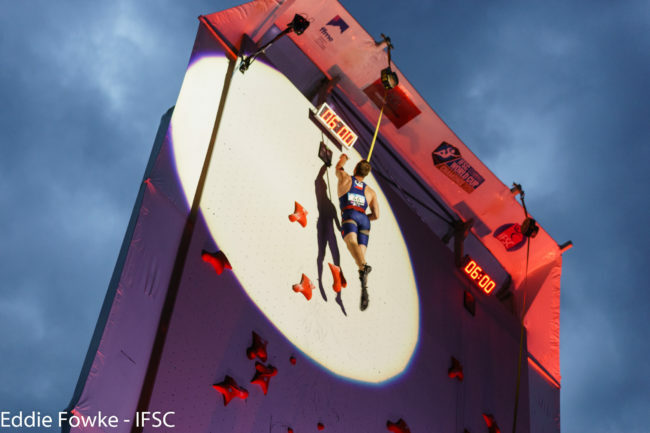 Perfect Descent Auto Belays have been featured in the top competitions beginning with last year’s IFSC World Cups in Chamonix, France and Villars, Switzerland, and the 2016 World Championships in Paris. 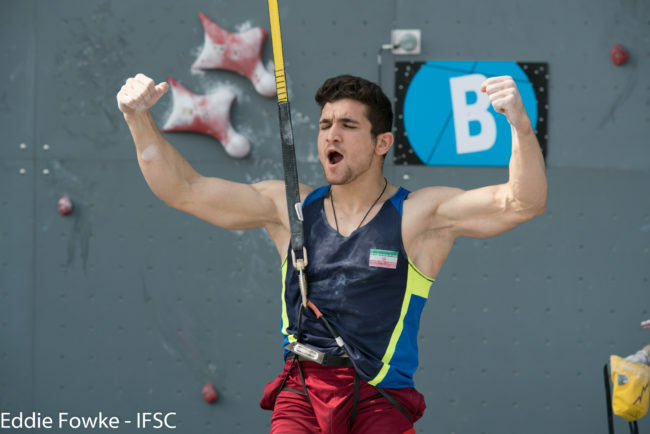 Unlike the response to the Olympic format, Perfect Descent Auto Belays have been widely accepted by both athletes and ofﬁcials as a positive advancement for the sport. 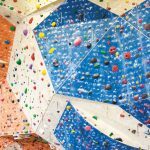 Easily recognizable by their iconic yellow lanyards, Perfect Descent Auto Belays can be found hanging from a growing number of competition walls, in climbing gyms, and fun climb centers around the world. The original speed-drive auto belay, Perfect Descent is also the smallest and lightest unit, and features the highest-quality components matched with the lowest cost of ownership of any auto belay on the market. Perfect Descent featuring exclusive Speed Drive Technology® keeps pace with the world’s fastest climbers by providing retraction without resistance and is always ready for the perfect catch and lower. The rise of speed climbing is already on pace to change the way we view sport climbing. 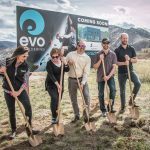 Climbing gym manufacturers are seeing speed wall orders increase around the world and they are not just for competition. 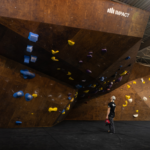 As new gyms open their doors, we will see more speed walls mixed into their vertical square footage and more climbing teams ﬁlled with aspiring speed climbers training for the chance to represent their country on the world’s top athletic stage.